Young adults from working class homes are more likely to drink heavily if they smoked during their teenage years, whereas their middle class peers start drinking excessively if they go on to higher education. Researchers from the University of Glasgow and University of Essex analysed information on almost 30,000 British people born in 1958, 1970 and 1972 who are taking part in the National Child Development Study, 1970 British Cohort Study and the West of Scotland Twenty-07 Study. They examined the daily smoking and weekly drinking habits of participants at age 16, and then looked at their alcohol intake in their early 20s. The researchers found that young adults took different paths to heavy drinking depending on their social background. Those who went on to higher education or vocational training after the age of 18 – who tended to be middle class – were more likely to drink heavily in early adulthood, compared to those who did not continue their studies. This was especially true for women. Teenage smokers – who were more often from working class homes – also tended to drink heavily in their early twenties, compared to those who did not smoke in adolescence. Heavy drinking was categorised as more than 14 units per week for women, or around 6 glasses of wine, and 21 units for men, which is approximately 9 pints of beer. 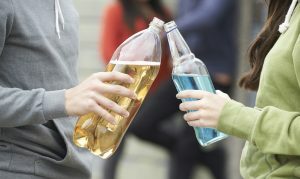 The study’s authors suggested that students tended to drink heavily because of increasing independence and freedom, few adult responsibilities and close involvement with peers in similar situations. They added that young people from less advantaged backgrounds began smoking earlier and moved on to heavy drinking due to a lack of alternative activities, less monitoring from parents, as well as increased exposure from parents and peers who also smoked and drank heavily.